In 1895, a Lawrence University geology class took a field trip to Mosquito Hill outside of New London, Wisconsin. According to the legend, A. Arthur Bennett ‘95 and his classmates found a large boulder on the side of the road and decided to bring it back to campus. 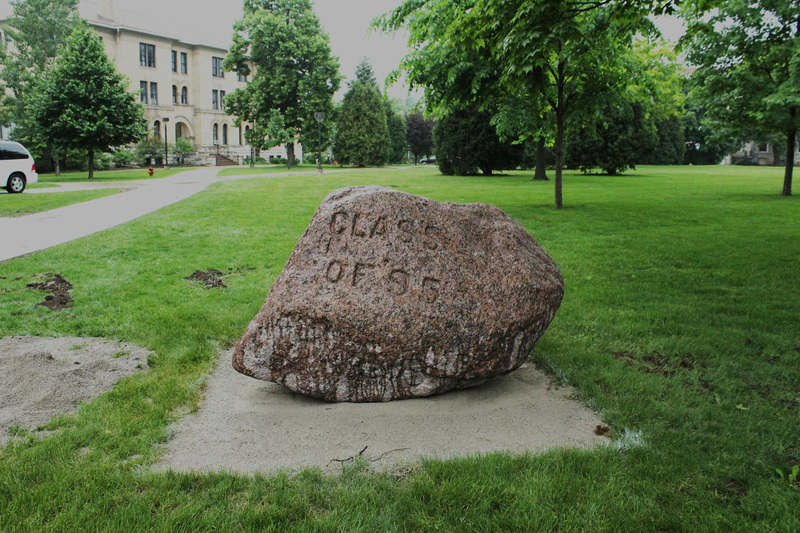 The students secured the use of a horse and wagon to bring the four ton rock to a flatcar which then shuttled the boulder to campus where the students carved “Class of 1895” into the granite. This gift from the Class of 1895 would become one of the longest-standing icons at Lawrence. Throughout the years, the Rock has been moved countless times. It became a favorite past-time for Lawrentians to secret the Rock away to a new location in the middle of the night. The Rock was also painted and carved regularly, whether by celebrating graduates or rival students from Carroll and Ripon. In 1939, the administration dumped the Rock into the Fox River, but it was quickly hauled back up by students. 1957 saw the appearance of a papier-mâché duplicate of the Rock that was placed on the roof of the then-science building, Stephenson Hall. In 1963, the Rock was buried behind Brokaw, then dug up again and transported to Plantz Hall by a group of freshmen. By 1998, following a feud between two rival fraternities over the Rock, it found its home on the front lawn of Sampson House. But overnight, it vanished without a trace for 20 years. On Wednesday, May 30, the Rock returned to Lawrence University after a two-decade sabbatical (although there are reports that the stone has been on campus, in hiding for a few months now.) Students awoke to find the long-absent stone resting on the lawn in front of Main Hall, unscathed apart from some remnants of chipped paint. It is as of yet unknown how the Rock came to return to campus, however it’s likely related to the investigations of two Lawrence alumni, Sarah Axtell ‘17 and Jon Hanrahan ‘16. In 2015, the two embarked on a quest to find Lawrence’s treasured boulder. They delved into the archives and interviewed Lawrence alumni and staff and were able to track down the Rock on a farm in Kaukauna. Axtell and Hanrahan produced a four-part podcast detailing their journey, the full episodes of which can be found on the podcast website, nsupodcast.rocks. Axtell has hinted that a new episode is in the works that will detail the triumphant return of the rock. For now, Lawrentians everywhere are rejoicing at its mysterious return and hopeful that the Rock is here to stay.